Holds and dispenses 83 oz or 2.6 quarts (2.5 liters) of liquid and lotion soaps, synthetic detergents and antibacterial soaps containing PCMX and/or Triclosan. Shelf/cover held closed with a concealed latch. Soap is manually dispensed by pushing valve button until supply is depleted. 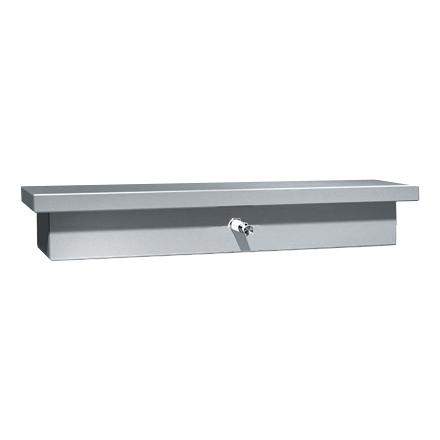 Unit may be reloaded easily by opening hinged shelf/cover. Tank supply is replenished manually. 17-3/8″ x 3-7/16″ x 5-1/16″ (440 x 87 x 130 mm).